I want to know the position of the iBeacons when the user its near by. i am using the estimote device. i am able to get the distance within the iBeacons. but How to calculate the position. Please check the below image. This is the screenshot from the estimote application. Note : i have put my iBeacon device to the estiomote application. they detect the movement of the iBeacons. so how they do it? iBeacons don't work that way - you can get an estimated distance, but the signal is non-directional, so there is no way of knowing which direction the iBeacon is in. This is Wojtek Borowicz, I'm a community evangelist at Estimote. The beacons do not broadcast their position with X and Y values. They only transmit their ID, sensor data, and information about signal power, based on which the proximity is calculated. The only way to include long/lat and associate it with beacons in your app is to either hardocde their location into the app or fetch it from a database in the cloud. The radar sceen in the Estimote mobile app doesn't show the location of the beacon. The app does not determine the direction from which the signal is coming, only the proximity. The visual representation is simply an UI thing, to help visualize the idea behind this technology. You can't. That was never a design goal of iBeacon. You know that the device is near the beacon, that's all you should need to know. To get your location, use CLLocation. Beacons are dumb, they only know who they are, never where they are. Blockquote Note : i have put my iBeacon device to the estiomote application. they detect the movement of the iBeacons. so how they do it? Not the answer you're looking for? Browse other questions tagged ios objective-c xcode ibeacon estimote or ask your own question. 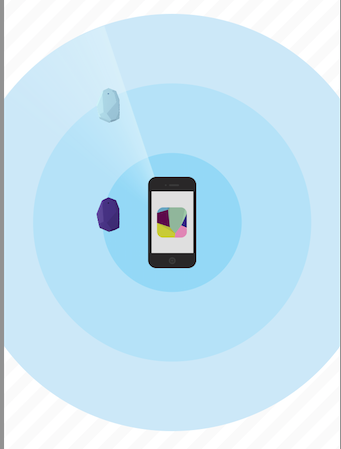 CLBeacon: How can I get the distance from the IBeacons? How to find angular position and distance of Estimote iBeacon against iPhone? How to set time for scanning interval for iBeacon on iOS?